The owner of this machine had sent both the original CPU board and the Sound board to a pinball repair company located in Illinois. The owner had found this company listed on E-bay. He said neither board worked when he received them back. The owner also had a after-market CPU board made by Ni-Wumpf installed in the game. It operated without problem (although without sound). So we used Ni-Wumpf to figure out why the sound board wasn’t working. After checking supply voltages, I traced the audio signal with my oscilloscope. I could see the audio coming out of the sound generator chip and going into the audio amplifier chip. But there was nothing coming out of the amp chip (LM380N). I verified that the output circuit wasn’t shorted, so everything was pointing towards a bad LM380N. I would need to need to take the board back to my office for repair. Next, I turned my attention to the original Gottlieb Systems 80 CPU board. The fact that the Ni-Wumpf would work with the game, indicates the pinball machine itself was not the cause of the original CPU board not working. The Illinois pinball repair company was blaming the slam-tilt circuit for the board not working. We checked the slam-tilt wiring and it was not at fault. In fact, someone had soldered the slam-tilt wires together so that it would never activate. The symptom was that the game wouldn’t boot-up and would cycle the Tilt Relay about once per second. Searching the internet revealed that this is usually associated with a bad or corrupt ROM. Obviously, neither board was fully tested before leaving the pinball repair company in Illinois. Also, the ICs they replaced were sanded and painted. In my opinion, no reputable repair service will do this. I can’t even imagine why they do this. The sanding can cause a huge build-up of static electricity, which will damage the chips. I also noticed the sound board card edge connector was sanded. We don’t know if the other repair company did this, but someone had sanded through the tin and nickel plating, which doesn’t oxidize very fast, down to the bare copper which oxidizes rapidly like a penny does. Oxidation will cause the contacts to develop a high electrical resistance and cause lots of intermittent problems. The best way to clean a circuit board edge connector is to use a pencil eraser and follow up with some denatured alcohol to remove any oil residues. We didn’t do any further testing with the CPU board because the owner wants the other pinball repair company to make it right. I brought the sound board back to my office. I purchased an LM380N at JB Saunders in Boulder, and de-soldered the faulty chip and replaced it. I connected a power supply to the board and with a signal generator, injected a signal into the input and verified the amplified signal was on the output. The datasheet states the LM380 has a voltage gain of 50. 0.2V input was amplified to 10V on the output. I shipped the board back to the owner. Before reinstalling the sound board, I had him check to make sure there was no voltage on the speaker wire. The presence of a voltage would indicated the speaker wire was shorted someplace and would probably damage the sound board. He reinstalled the sound board and everything worked. Symptoms: Weak flipper, lower playfield general illumination not working. I started with the flipper. I checked the mechanical aspects of the flipper by manually turning it. Then I checked the end-play by lifting it up and down, and tried to rock it back and forth to check whether the flipper bushing should be replaced. Mechanically, everything seemed fine. Next I turned to the electrical aspects of the flipper. Flippers of this type have two coils wrapped around the solenoid coil bobbin. One coil provides a strong magnetic field for starting the movement of plunger (slug) into the solenoid. The other coil provides a weaker magnetic field for holding the plunger once it has been drawn inside the bobbin. The force required to hold the plunger is less than what it takes to draw it in. 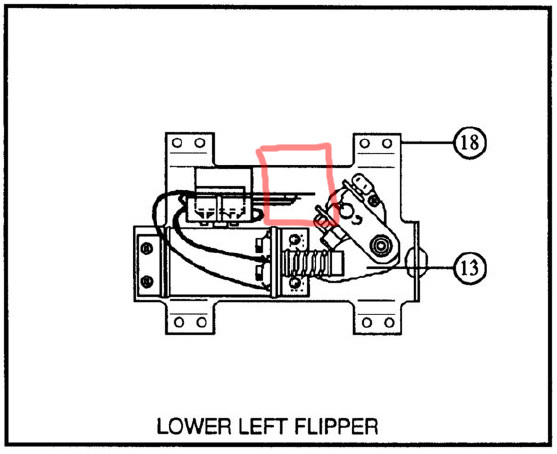 When the flipper button is pressed, both coils are initially energized. Once the flipper is at it’s ending position, it opens a switch that turns off the more powerful coil and leaves the weaker coil energized. This allows the flippers to be strong, but prevents them from burning up if someone were to hold the flipper button. If power were applied constantly to the more powerful coil, it would overheat and start burning. The switch that opens when the flipper reaches its end position is called the End of Stroke switch (EOS). I check the EOS switch with the power off and the flipper in its normal resting position with my ohm-meter, and it was “open”, when it should have registered a short. I cleaned the contacts with some 440 grit sandpaper, and adjusted the contacts to make sure they were closing when the flipper was at rest. Drawing of flipper unit from the Police Force manual, showing the End of Stroke switch. I rechecked the switch contacts with the ohm-meter and they were working properly. We powered-up the machine to verify the flipper was working fine. Basically, since the switch wasn’t closing, the flipper was only running with the weaker coil. Next I took a look at why all of the General Illumination (GI) lights in the bottom half of the playfield were not working. The GI lights are the ones that stay illuminated all of the time and light up the plastics and the playfield areas so that you can see the ball. First I checked to make sure no voltage was present at one of the light sockets. Although it was a remote chance, I wanted to be sure that it wasn’t just a case of the lights being burned out (which could have happened if there was a short with a higher voltage somewhere else in the machine). There was no voltage (be sure to measure on AC scale). I checked where the power was coming from the Backbox Interconnect board, and there was 6.3 volts there. So somewhere between the backbox and the playfield, the voltage was getting lost. I tipped the playfield all of the way up and found the GI Relay on a small circuit board at the very bottom edge. The connectors that connect the wires to the board were burnt and falling apart. The connector on the circuit board was burnt as well. Connector failure is a common problem with GI lighting in pinball machines. Oxidation builds up on the connector pin, or the crimp, and causes the resistance of the connection to go up. This causes the connector to heat up until it fails. Because each machine and manufacturer uses different types and sizes of connectors, it’s difficult to to keep connectors on hand. In this case, I didn’t have replacements with me. The owner didn’t want to wait to get the proper connectors and asked that I solder the wires directly to the circuit board. I did so, and the lights all worked fine after that. Normally I am a purist about having the connectors fixed properly, but in this case the connectors only served to make the board replacement easier, which is unlikely to ever need replacing. We checked and replaced several burned out lights. The game was working well and in good condition. Symptom: Pinball machine wouldn’t reset. I visually checked the most likely relays and contacts: Game Over, Coin, and Credit. After not finding any problems with the relays, I checked the switches on the score motor unit. I noticed that the motor was hot and was obviously energized, but not turning. The cams rotated freely but the electric motor itself was seized. I disassembled the motor and managed to get the seized shaft out of the bearing. I cleaned both shaft and the bearing, but there was still some type of corrosion on the shaft that was preventing it from turning freely. I would have preferred burnishing the shaft with some very fine 0000 steel wool, but I didn’t have any on-hand. I used some 800 grit sandpaper and removed the corrosion (or whatever it was). I lubricated the bearing and the shaft so that it slid and rotated freely. After reinstalling the motor into the scoring unit, the machine reset correctly when pressing the start button. The scoring motor and switch bank assembly is basically the heart beat that runs an electromechanical game. Without it, nothing will work. We (the owner and I) noticed that the Ball In Play lights were not resetting back to Ball 1 during the reset. I checked the stepper in the backbox and saw that it was sticky, which is a common problem. It didn’t seem sticky enough that it warranted rebuilding. The Ball In Play stepper unit is a step-up and reset type. The owner cleaned the old lubrication from the contacts and I added a turn on the spring. The stepper seemed to function fine after that. I informed the owner that if problems continued with the ball counter, that it would have to be cleaned and re-built. We replaced some burned out lights on the playfield and talked about playfield care. I mentioned that a lot of collectors have differing opinions, but that I liked Novus 2 for playfield cleaning and polishing. As for me, I’m going to start carrying 0000 steel wool in my repair kits for cleaning up motor and stepper shafts. It has worked well with jukebox restorations I’ve done. The owner had previously rebuilt the stepper relays and adjusted the relay contacts which had improved things considerably. There were a few things that were still not working, including the “strike” and “spare” scoring, and the game reset. After tracing two problems back to relay contacts that needed adjusting, I decided it would be more efficient to check and adjust all of the relay contacts rather than tracing each symptom. I found 3 more sets of contacts that needed adjusting. After that everything was working pretty well. It was an amazing machine with the sound of the electro-mechanical parts, buzzing, clicking and ratcheting the score, all of which was amplified by the wooden cabinet. Some EM pinball machines are more complicated by comparison, but they don’t have solenoids and relay coils that are as large and noisy. This thing is awesome! Symptoms: Two of the displays had digits that were blank (off). General illumination lights on the backbox were not working. I ran the display self-test to determine the full extent of the display failures. One digit on the Player 1 score and one digit on the Player 4 score were not working. They were different digits, so it wasn’t a problem with connections from the CPU board. I started with the Player 4 display. I disconnected and removed the display from the backbox panel and checked the digit driver transistors with a mulitmeter on the “diode” scale. The transistors checked OK. This was a little surprising to me. So I connected an oscilloscope to the digit drive signal. It was OK where it was coming into the display board. 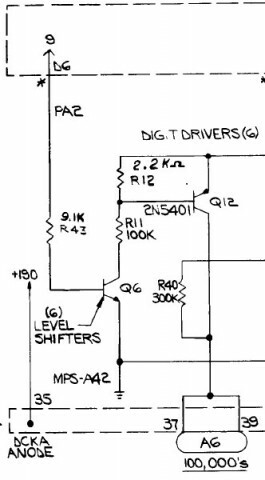 There was no signal on the collector of level shifter transistor (Q6 in the diagram). Surprisingly, the 100K resistor was bad and read “open”. 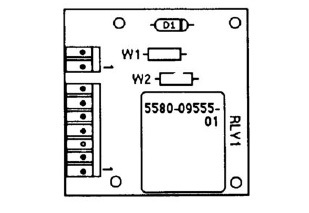 Schematic showing one of the digit drivers. I had previously read about the power rating of these 100K resistors being too small as originally designed, but I wasn’t expecting to see a failure with no visual indication of the resistor being over-heated. I didn’t have any spare 100K resistors with me, but fortunately Radio Shack is still good for some very common parts. I disconnected and removed the Player 1 display and immediately checked the resistor for the failed digit and it too was bad. With the resistors from the nearby Radio Shack, I was able to desolder and replace the resistors on-site. I re-assembled the displays into the backbox and re-tested. Everything worked fine. As for the general illumination lights not working on the backbox, this is a common problem and is often related to a connector. This was no exception. I traced the non-working branch of lights back to the connector at the power supply board. A portion of the connector on the PCB had been previously replaced, with a version with slightly shorter pins. The lights started working with just touching the connector. I checked the solder connections on the back side of the PCB and cleaned the connector contacts. As I usually do when I work on a pinball machine, I ran a light test and replaced several bulbs that were burned out on the playfield.